Fly Fishing has been some of the best of the year. 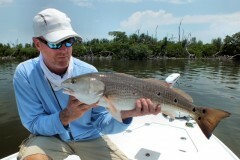 Multiple hookups of Snook, Redfish, Trout and Tarpon. Yes, I said Tarpon. Unbelievable huh? The weather has been great so the water temperature has been unseasonably warm. 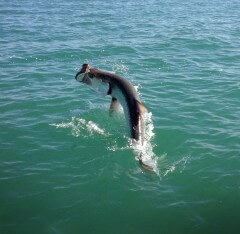 That makes the Tarpon happy so that makes my clients happy. I was even able to take the bow and cast a little lately and yes I was lucky in getting a pretty nice fish that liked jumping so good times had by all. We’ve also had multiple hookups with Tripletail, Bonita, Mackerel, Jacks and a few Kings. Not sure how long this will stay as our northern friends are sending us some Northern fronts to calm down our bragging.